Most of us have had the pleasure, or been the victims of, bad church signs like the one in the title. This past weekend at our Grace Church Bloomington vision event, Craig Knisley (lead pastor) started off reading a few of these signs out loud for a good laugh. The point of it was this: cheesy signs are not what bring people to church, people bring people to church. Some estimate Bloomington has a 39% poverty rate. One local pastor says that homelessness is the single greatest justice issue. There are thousands of students from all over the world who don’t know Jesus. The first U.S. built Tibetan monastery is in town. An overall cynicism of religion, church, and Christianity exists. In a place like Bloomington, with the idea that people bring people to church, and new churches see more people surrender their lives to Christ, we at Grace Church Bloomington have a mission to transform the streets of Bloomington with stories of God’s grace through a multiplying movement of passionate people. As a new baby church being sent out by Grace, we want to be sure we are starting as healthy as we possibly can. We want to put every ounce of effort we have into launching from day one as a healthy expression of God’s Kingdom here on earth. With that, we know that we need to start with a team of folks who are willing to serve and help us accomplish that goal! We are calling this team our BUILD team. 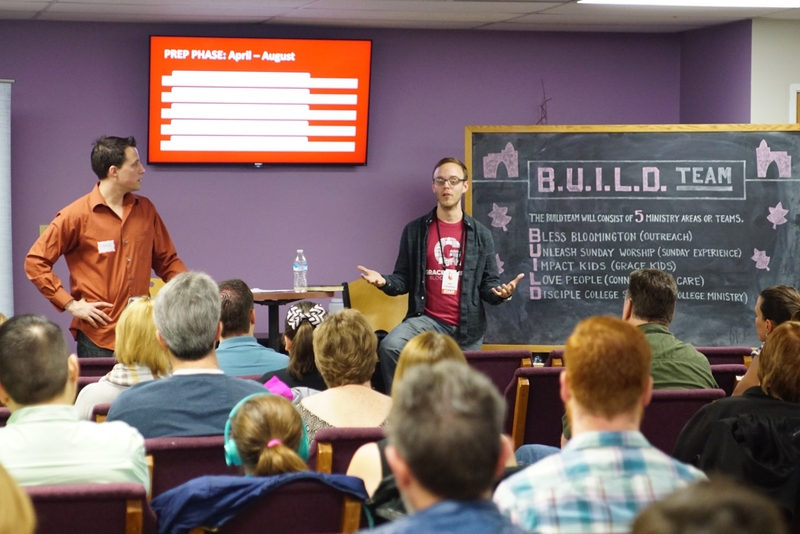 The BUILD team is a short term mission team geared to the healthy launch of public worship in a church plant. Can you imagine yourself helping to get a fresh new expression of God’s Kingdom started? Can you imagine hearing stories of people bringing people to a church that is transforming Bloomington? We would love to have you join us! Reach out to Craig at craigk@gracechurch.us for more info!